As I sit here in my lovely new home, I am struck by looking around me that we’ve decorated with things we bought while living in France, or things that remind us of France. It didn’t start out that way, just kind of evolved. Since we moved in we’ve been taking a laissez faire kind of attitude about hanging things on the wall. Typically the houses we’ve lived in have had mostly my father’s original oil paintings on the walls. Many of them are still hanging on walls in the cabin. My father painted two kinds of scenes: Colorado and Florida, both being places we lived and visited when I was a teenager. None of which really fit into our new home, although we do have a Florida beach scene of his hanging in our bedroom over our bed. (I know Kim Murray, GASP, if you are reading this blog entry.) But, it seemed to work. First to go up on a wall was a print of a steep staircase ascending an obviously European city we bought at American Furniture Warehouse, of all places. Not only did it remind us of old Lyon, it had the right colors and height to hang above the fireplace. We looked high and low for a good-sized clock to hang on the wall, and when we finally found one we loved it said Cafe de Paris ... France on the face of it. Not planned, just liked the clock. In our dining room hang four miniature oil paintings that we bought on various visits to Paris’s Montmartre. We watched each and every one of them being painted by the artist. Also, there is a watercolor painting of sunflowers we bought in Provence. Two framed menus remind us of beloved restaurants that we ate in, one is signed by the restaurant owner, Paul Bocuse. 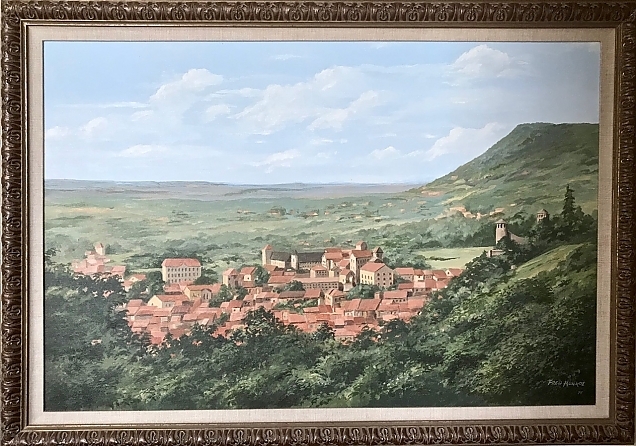 And last but not least, the oil painting by my father, the last one he ever did for me, of the view we had from our house in France of the medieval walled village that we lived in, Crémieu, hangs in the bedroom hallway. Previous entry: Time to Start Blogging Again?